Olive Oils in Clear Bottles – No Good! You buy extra virgin olive oil because it is delicious but also because you think it’s good for you. You are absolutely right: EV olive oil is rich in antioxidants that are good for your health. Everybody knows, but now it is also confirmed by two new studies published in the Journal of Food Science: the health benefits of antioxidant-rich oils wane if the oil are stored for too long or not properly. Antioxidants stay in the olive oil IF the bottle is not exposed to heat and light. Therefore, any decent olive oil producer would NEVER bottle the olive oil in a clear bottle. 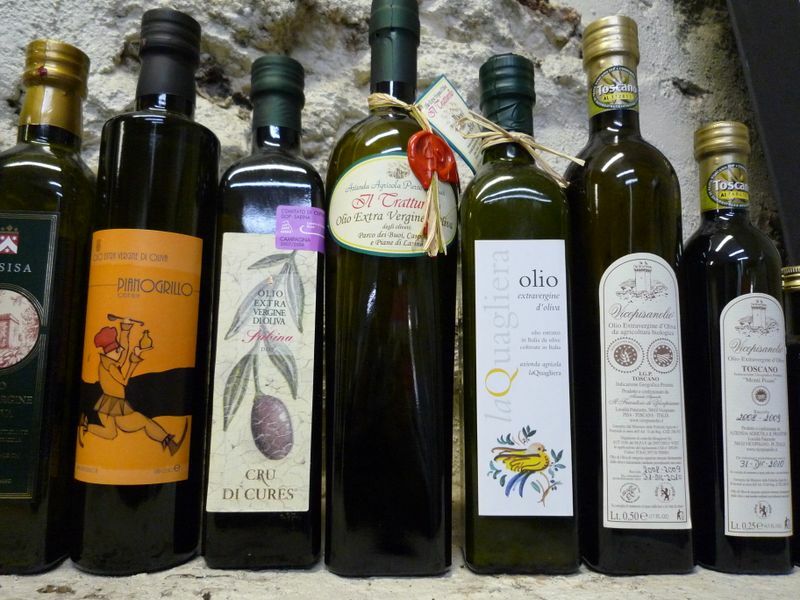 Ergo, BEWARE of olive oils which are bottled in clear bottles and BEWARE of the merchants who sell them. It is not good for you. And it can’t be good to the taste, either. Why would any producer of good olive oil put it in a clear bottle? These are Gustiamo’s olive oils. The bottles are so dark, you can’t even see what’s inside. In fact, the color of the Olive Oil is only a marketing gimmick. It doesn’t mean anything. Professional tasters taste olive oil in a dark glass little cup, because its color has no relevance to its quality and taste. Next Post Mario Batali Plays Golf!